Posts that don’t fit any other categories. Monday Should Be an Interesting Day at Work. Microsoft pulls the offer for Yahoo. Adding a third kid to the mix at home definitely takes up some time. Work is very busy and very engaging leaving not much time to blog. A lot of the stuff I would say and discuss is either off limits while doing what I’m doing, or at least close enough to the line that I don’t want to spend the time analyzing it. I would like to get to posting a bit more, so perhaps you’ll see some quicker posts with just quick comments. I tend to want to provide a lot of value to a post, but I rarely have the time to sit down for an hour or more and work on a lengthy post. One thing that may help solve this is I’ve installed the wphone plugin so I can post directly from my iPhone. I’m finding that I’m interacting with Twitter and Facebook much more because I’m so often using my iPhone while traveling or out and about, so maybe if I can post to this blog easier through the iPhone I’ll do it more. 1. 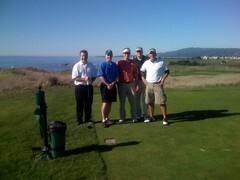 I’ve had a number of recent offsite work trips recently that have been very productive and fun. There have been great discussions with smart people, and a lot of excitement about what we’re building at Yahoo! despite any clouds looming on the horizon. 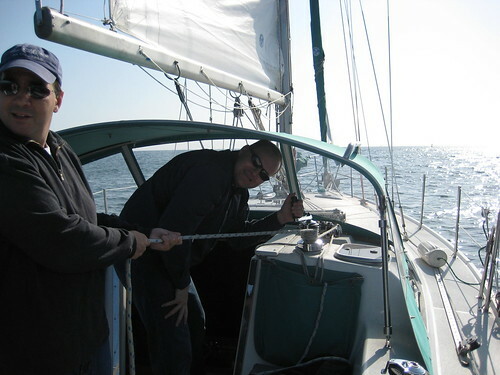 As you can see from the picture above while sailing in the Pacific Ocean, the offsite meetings also have a little fun as well. Unfortunately my team didn’t win the sailing race. 2. 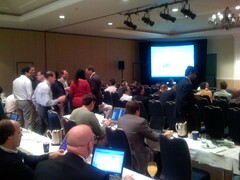 Ad Tech in San Francisco was quite a show, as it seemed like the largest show in recent memory. Unfortunately, I wasn’t really blown away by much there, as it seems like a lot of companies are competing in the ad network and ad exchange space without really differentiating themselves significantly from the competition. 3. The iPhone is really the most revolutionary thing web or technology wise that’s hit me in a long time. I’ve had mine for quite a while now, but it amazes me how useful it’s become. I also find that I do more RSS feed reading, twittering, Facebooking, and Digging on the iPhone than on a normal computer. Part of that may be because I’m traveling quite a bit, but I think mainly it’s because those applications all have simplified versions for the iPhone that I find more usable than the full web versions. I can’t stand the normal version of Facebook now compared to the ease of use and simplicity of the iPhone version. 4. My family is a lot of fun right now with the three kids all making it pretty wild at home. 5. I’m excited for summer and fall, as they are really the prime two seasons in Eugene for enjoying the outdoors. Hopefully I can follow this up with an increased frequency of posts, although I anticipate keeping them pretty short until I have more time in my day at some point. As a father of three kids, I found the following video from Dr. Randy Pausch to be important and quite moving. Paush is a computer science professor at Carnegie Mellon who only has a short time to live due to pancreatic cancer, and he made a special last lecture for his class and most importantly his three kids that is about his mindset and how to live life. Pretty inspirational stuff. Over on the YPN Blog, Jerri Gillean here in the Eugene Right Media/Yahoo! office contributed an overview of what an Ad Exchange is and some important questions to ask when comparing ad exchanges. 1. Does it work in real time? Using historical data is like checking yesterdayâ€™s weather to predict what to wear today. 2. Is it neutral? A neutral exchange simply provides a technology that allows for buying and selling, and doesnâ€™t attempt to hold all the relationships with the buyers and sellers. 3. Is it scaleable? If your site goes from 100,000 to 100,000,000 impressions a month, will that exchange be able to handle that volume? 5. Is there open competition? Does the exchange allow non-members to compete with exchange members? 6. Is it a community? Sure, thereâ€™s competition, but are there also forums so that people can communicate with each other and form partnerships? 7. Is it a technology platform? Is it open, with APIs that anyone can connect to? 8. Does it have publishers, advertisers AND networks? 9. Is there a solution for me? Does the exchange offer a solution for both enterprise and non-enterprise publishers? 10. Are there strings attached? What else does the exchange require you to do? In my opinion, not everyone claiming to be an ad exchange today really is one. So the questions Jerri lists are definitely interesting to ask across all the companies who say they are operating an ad exchange today. HipMojo points to and analyzes a report from WPPâ€™s GroupM unit that Sweden will be the first country where internet advertising surpasses TV advertising in 2008, and it would happen in the UK in 2009. This is major. While I think it will take a bit longer in the USA, it’s happening faster than I would have predicted a couple of years ago. It’s been heating up for a while in the online ad platform space, and it’s now going to get hotter with Google and Doubleclick’s merger allowed to proceed by the FTC. I expected it would be approved, so no big surprise here. I’ve often thought solar power was one of the most promising clean energy options for many reasons, but it seems as if the advancement of the technology hasn’t moved as fast as it should or is capable. Over the last couple of years I’ve read about many promising advancements that seemed to start pushing solar forward. The latest news from a company called Nanosolar gets me excited as they’ve brought a new flat panel solar technology to a commercial state that is cheaper than many past solar options. The announcement that Yahoo! Mail and Yahoo! Messenger are partnering with Jet Blue to offer lightweight wifi services on flights is both extremely cool, and kind of sad at the same time for me. Being that I’m traveling a lot now for work it becomes readily apparent when I’m in the air that it’d be nice to be able to connect to the web in order to get work done and communicate with colleagues, friends, and family. However, in a weird way I also treasure those few hours of internet-free time to read documents or get stuff done that is harder to focus on with connectivity distractions. It’s also a good time to just relax on occasion by reading a book or watching a movie. I guess as connectivity hits the friendly skies it will just be another place I’ll have to learn to block out distractions to relax or be extremely productive. 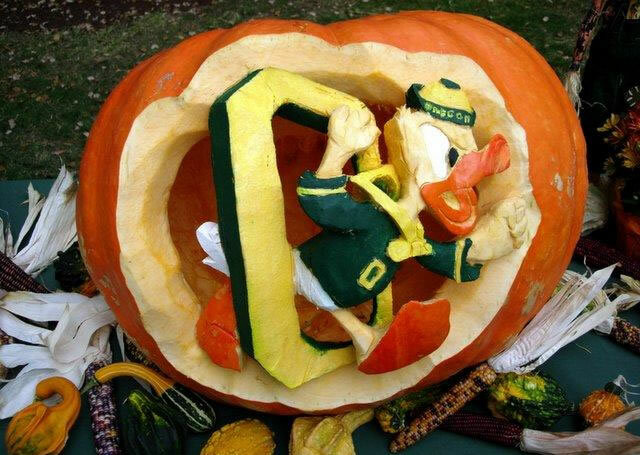 Happy Halloween, Go Ducks this weekend against ASU in one of the biggest games ever at Autzen Stadium, and hat tip to Mike McNeeley for the image. I’ve been to a lot of web industry events, so I’ve become pretty picky on what actually makes a good one. It’s essentially nailing the combination of event content, organization, location, social events, and the quality of the people there. While maybe not an A+ in every category, the Right Media Open that occurred last week in Half Moon Bay was the best event I’ve ever attended. There is bias in my opinion since I work for Right Media and played a part in planning and executing the event, but this is also my blog and my opinion, so let’s just roll with it. I had an advantage in enjoying it since I knew the majority of the attendees and was interested in the content, but I can objectively judge the location, reaction of the attendees, the activities, and general mood of the event. And those were all off the charts. Half Moon Bay is supposedly cloudy and rainy for much of the year, but we had 75 degree weather to go along with the amazing views and quality of the Ritz. There was golf, Segway tours, tennis, fitness, poker, drinking, comedy, and somewhere mixed along the way we had numerous speakers and panel discussions about advertising exchanges. The highlights for the majority of the world may have been the Jerry Yang Keynote, or the Competitor Faceoff, but I probably was most amused watching my fellow coworkers crack jokes while running their panel discussions. Special thanks to Jeanette O’Donoghue, Lauren Axelrod, and Meredith McTernan for putting the event together, and to the rest of the Right Media team for making it all happen. Also a huge thanks to all the great attendees who are pioneers in the online advertising space. 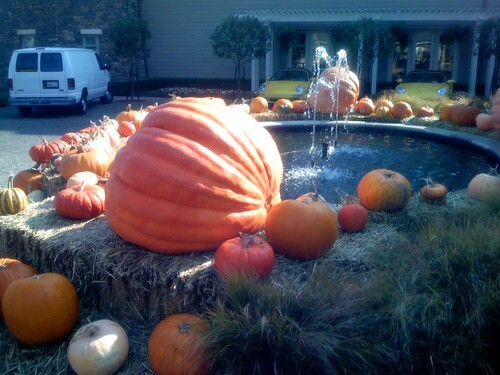 Oh, and they also had really large pumpkins.